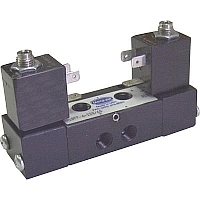 18 Series Valves by Fabco-Air are ⅛" NPT port 2-way, 3-way, and 4-way 2-position valves. The finest in simplicity, these valves are also suitable for vacuum directional control but NOT for holding vacuum. Short stroke of lightweight Delrin® spool provide fast, positive and reliable performance.